Together with Sarah and Harry, the Doctor finds himself stranded on the war-torn planet Skaro where the conflict between the Thals and the Kaleds has been raging for a thousand years. Chemical and biological weapons have started a cycle of mutation among the planet's inhabitants that cannot be stopped. But Kaled scientist Davros has perfected a life support system and travel machine for the creature he knows his race will ultimately evolve into - the Dalek. The Doctor's mission is to stop the creation of the Daleks! 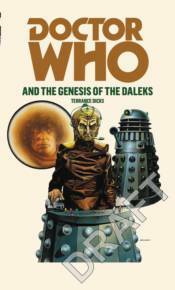 This novel is based on a Doctor Who story which was originally broadcast from 8 March-12 April 1975. This title features the fourth Doctor as played by Tom Baker with his companions Sarah Jane Smith and Harry Sullivan.